As I write these words, our St. Saviour’s Anglican Church in Suez is under heavy attack from those who support former President Mursi. They are throwing stones and Molotov cocktails at the church and have destroyed the car of Rev. 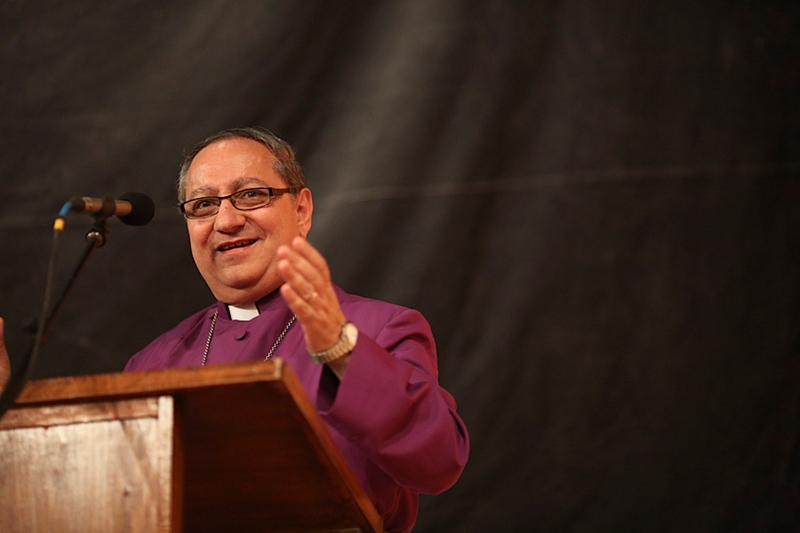 Ehab Ayoub, the priest-in-charge of St. Saviour’s Church. I am also aware that there are attacks on other Orthodox churches in Menyia and Suhag in Upper Egypt (see attached photo), as well as a Catholic church in Suez. 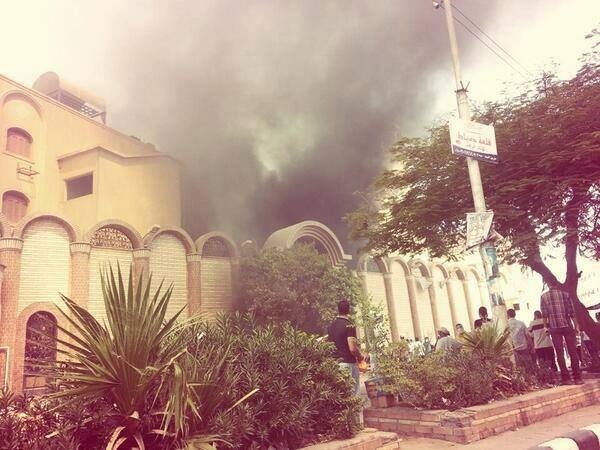 Some police stations are also under attack in different parts of Egypt. Please pray and ask others to pray for this inflammable situation in Egypt. Early this morning, the police supported by the army, encouraged protestors in two different locations in Cairo, to leave safely and go home. It is worth mentioning that these protestors have been protesting for 6 weeks, blocking the roads. The people in these neighborhoods have been suffering a great deal—not only these people, but those commuting through, especially those who are going to the airport. The police created very safe passages for everyone to leave. Many protestors left and went home, however, others resisted to leave and started to attack the police. The police and army were very professional in responding to the attacks, and they used tear gas only when it was necessary. The police then discovered caches of weapons and ammunition in these sites. One area near Giza is now calm, but there is still some resistance at other sites. There are even some snipers trying to attack the police and the army. There are even some rumors that Muslim Brotherhood leaders asked the protestors in different cities to attack police stations, take weapons, and attack shops and churches. A few hours later, violent demonstrations from Mursi supporters broke out in different cities and towns throughout Egypt. The police and army are trying to maintain safety for all people and to disperse the protestors peacefully. However, the supporters of former President Mursi have threatened that if they are dispersed from the current sites, they will move to other sites and continue to protest. They also threatened to use violence. There have been a number of fatalities and casualties from among the police as well as the protestors, but it seems that the numbers are not as high as expected for such violence. However, the supporters of former President Mursi claim that there are very high numbers of casualties. The real numbers will be known later on. Please pray that the situation will calm down, for wisdom and tact for the police and the army, for the safety of all churches and congregations, and that all in Egypt would be safe. In my quick reading of events, it seems clear that live gunfire is being exchanged on both sides. Either infiltrators were very quick to penetrate the protests and fire on police, or the lie is given that these demonstrations were completely peaceful. Reports the past few weeks indicated the protest organizers were keen to check the IDs and pat down everyone who entered the sit-in. Many, probably the great majority, of those present were unarmed. But apparently, reports which indicated weapons were present were also true. So at this point they read these attacks as actions of the pro-Morsi crowds, rather than a black flag of the security forces, which they warned about weeks earlier. The speculation would be if this is their public face covering over their own private rage and instruction. Anti-Christian rhetoric has been employed by several Islamist figures ever since the original protest movement against Morsi in December 2012 when he issued a constitutional declaration granting himself absolute power (later rescinded, but protecting of actions taken during that time). But in this current climate, it is difficult to make sense of the situation. Patience is needed, for there will soon be a flood of propaganda. I hope you and your family are safe and well Jayson. I also saw Bishop Mouneer’s statement, and am confused/worried by the way churches seem to have become a target for retaliation against the army (?) Maybe I’ve been gone from Egypt for too long to have an accurate reading of what’s going on, but I do find the Bishop’s statement somewhat one-sided and suggestive of an “us” and “them” mentality within the upper echelons of church leadership, which I also find deeply worrying. Thoughts and prayers with you and all in Egypt at this time. « Is Islam Essentially Violent?